Other things that proved helpful: Goo Gone adhesive remover, oil, hacksaw, Dremel, power drill, wrench, gloves, protective eye-wear. Aside from all the hardware that is needed, one does have to start with nicely shaped bottles. I dragged a few bottles in similar sizes/shapes from the recycling bin and well yes, I admit it, I bought a few bottles just for the color (I had to have the blue!). Once I had my bottles, I filled a sink with soapy water, cleaned out the bottles and began to soak off the labels. Off to the hardware store! I started my search at Ace Hardware, well because Ace usually has EVERYTHING…well at least they usually do. Unfortunately, this time they let me down. Then I tried a couple other stores and eventually found what I needed in the plumbing department at Lowes. The “Copper Top Plate Connector” turned out to be a “ceiling flange” and I couldn’t find them in copper, so I compensated by picking up a can of copper metallic spray paint. Once I found all the components, I spray painted my flanges (which turned out fab!) and while they dried, I began to assemble the rest of my torches. Looking at my list of instructions, I figured the most labor intensive portion was going to be cutting the threaded rod into 4.5″ pieces. I dragged out my trusty hacksaw and found a place where I could kneel on the rod to hold it in place while I “hacked” my rod into segments. Thirty minutes and much grunting, snorting and cussing later…*ta-da! *…I had cut off one. Hmph! THAT’S not going to work. I have six to cut. Plan B. I remembered that the Dremel I bought my husband for Christmas had a metal cutting disc on it and dragged it out of the box. After a quick how-to on Youtube, I figure out how to put it together, placing the correct disc on top and we were in business! (Note: you want to be sure to wear protective eye-wear, long sleeves and gloves as sparks will fly when cutting the rod…*cue Flashdance theme*). The Dremel cut the remaining rod in short order and I was ready to begin my assembly. I checked on my bottles and I found I had to help work the labels off. Some had to be scraped and then re-soaked. Some just slid off. Once the labels were off, I used Goo Gone to remove the sticky residue. Also, you can try oil to remove the stick. Washing them one more time to ensure all residue was removed, I turned them upside down on a paper towel on the counter to drain of remaining water. My biggest fear was that once I cut the rod, the threads would no longer function to go into the plate as well as the split ring hanger. Thankfully, all the threads worked perfectly. Next, I took the painted ceiling flanges and took them to where I wanted them on my fence posts. I measured the same distance down from the top of the fence for all posts and with a pencil, marked where I wanted the pilot holes to be drilled. Once, the holes were drilled, I was able to screw in the ceiling flanges to the fence posts. From there, I screwed on hex nuts on both ends of the threaded rod and screwed them into the ceiling flange on the fence. I tightened the nuts closest to the fence with a wrench so that they fit securely. Next, I added the split ring hanger to the other side of the threaded rod, tightening the other nut so that the hanger was secure on the outside. At this point, I loosened my hangers in order to make inserting the wine bottles easier. At this point, I am getting very excited to see the finished product. I take my new torches and begin to screw them into the hanger. I have seen other tutorials suggest adding a padded adhesive (like that which you use to winterize doors) inside the hanger and I can see why. It would be easy to screw in the hanger too tightly around the bottle and break it. I carefully tighten the hanger and add the copper tops to keep the wicks dry when not in use. Voila! I am very happy with the results and here is what they look like lit up at night! I have a few other projects I will be adding where I have recycled glass. 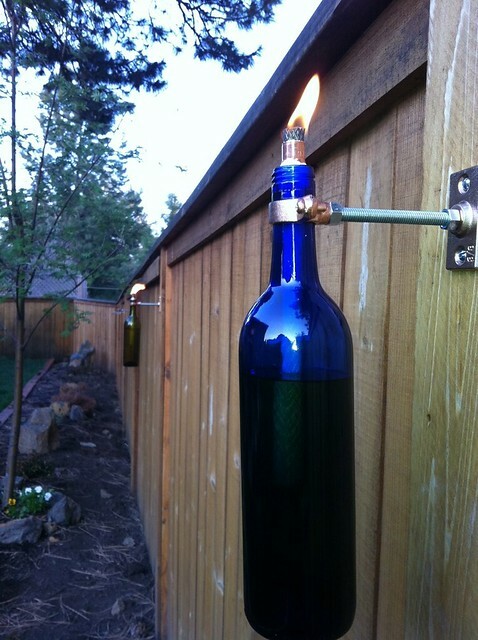 Do you have a project for which you have upcycled glass? I would love to hear from you!